This sweet, crunchy, fruity, savory, tangy salad is great for lunch or dinner. It features leafy greens, is high in protein, and fresh, springtime strawberries. Plus, it's low in FODMAPs. Grocery store rotisserie turkey is a nice short-cut. In a small skillet, toast walnut pieces over medium heat for 5 to 7 minutes, stirring constantly, until they are a shade or two darker, then remove from heat and set them aside to cool. Nuts burn easily, so do not leave them unattended. In a small jar with a tight-fitting lid, combine vinegar, water, sugar, salt, mustard, and olive oil. Cover and shake until the dressing is well blended, 30 to 60 seconds. 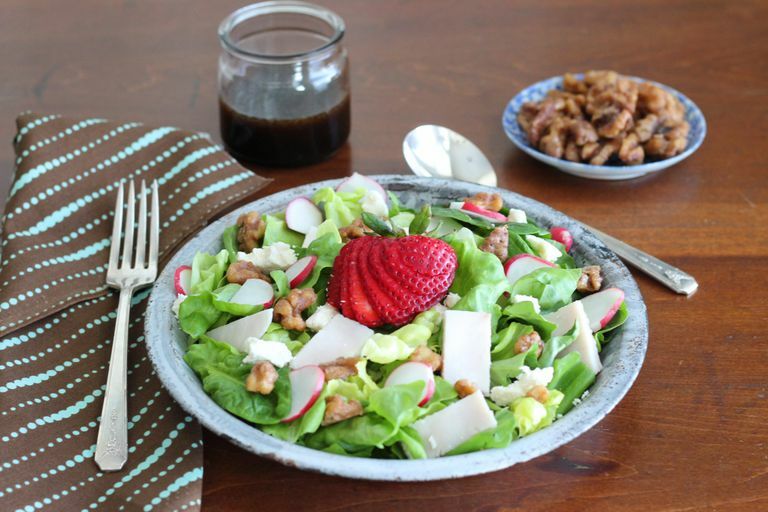 In a large serving bowl, combine the lettuce, spinach, radishes, turkey, walnuts, and sliced strawberries. Toss the salad with vinaigrette. Divide the salad into large bowls or plates and top each serving with chevre and toasted walnuts. Instead of roasted turkey, use cooked, sliced chicken. Deli turkey meat can also be used instead of roasted turkey, but the sodium content of the recipe will be much higher. Candied walnuts can be used instead of toasted, and you can also use feta cheese instead of the chevre. Vinaigrette keeps well in the refrigerator for up to 1 week. Why not double the recipe?